I think there might be a mistake in how Mastery is being evaluated by the guide. Its evaluated the lowest of the traits, and you can provide an easy mathematical comparison to vers since both give a direct damage boost by percentage. 350 rating points at lvl 110 gives 1 percent to both mastery and to vers, with masterys 1 percent giving 1 percent bonus mana and .5 percent damage boost per arcane charge, meaning while 4 arcane charges are active its a 2 percent boost in damage per 1 percent mastery. That would make the damage increase double that of Vers not including the gains made by having the additional mana pool to burn phase ratio. Maybe someone could explain how my calculations are off in this regard or if I am not mistaken Mastery is being dramatically undervalued in the guide. This has been argued a HUGE amount in the comments section, as well as in every mage community currently in existence. Going to sum everything up here. It makes no sense that Mastery is as bad as it is, but it is. Versatility is the best stat for Arcane. All of the secondaries are very close to each other in value, but Mastery is still bottom. This is a simulation that was done checking the stat weights. Haste is slightly above Vers due to the type of sim rotation used, but currently, Vers is better. This graph shows the weights of the different stats at a higher item level. Vers/Crit/Haste are all very close. Mastery is very clearly bottom. 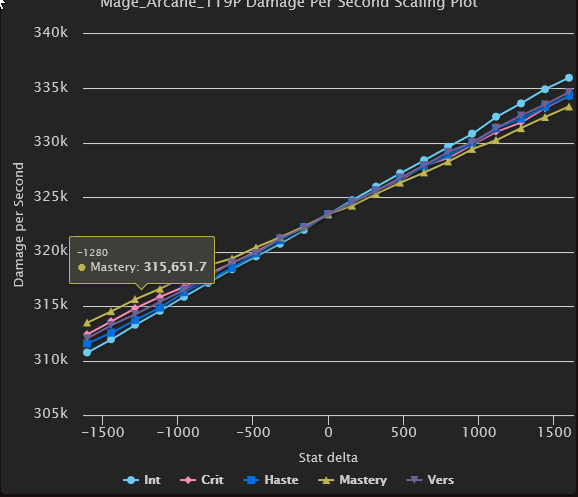 Yes, mastery does not apply to mark of aluneth directly, rather indirectly in the final tick to affect the damage portionment which is rather low. Its also odd that Noxxic's guide - stat weights list Mastery as second in Legion with haste being the lowest stat. Do you have copies of the statistics formulas used to get this information? Okay i had to be in game to see exactly how the game calculated the mastery and vers to understand why the figures werent coming up correctly. So with a base pool of 1.1 mil mana and arcane familiar mana pool is 1,676,000 mana a difference of 576k or 3.5 casts of arcane blast at 4 stacks. Vers does stack better damage wise because its calculates as a multiplicitive buff instead of additive. There is also no threshold of base damage that can make up the difference pushing mastery forward since the damage stacks additively and the mana pool is fixed. So nothing short of increasing base mana regen or increasing the mana pool effect of arcane familiar would improve the other half enough to make mastery more attractive. Sorry for the trouble i just needed to run the numbers physically with the right info. That's no problem, thanks for coming back to let me know and I'm sorry for the late reply. 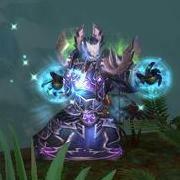 Just wanted to add, Blizzard are buffing Mastery next week due to it being undertuned, so it looks like Mastery might become the best stat now. Will have to see what Furty puts into the guide! 20% buff means that current mastery weight (.71 according to Furty's investigation) will instantly become .71*1.2=0,852 and it will make mastery the best stat for arcane. I don't know almost anything about simulations but if it uses only +damage component of mastery and ignores mana pull increase the result value will go even further. In my humble opinion, mastery "must be" the best stat for arcane because of game design. This is the only +dps stat that interacts directly with general idea of arcane spec. And it obliquely confirmed by numerous changes of mastery through all addons. In accordance with that feeling haste "must be" the worst stat for arcane. Not only because mastery will jump from the very bottom to 1-2 position but cause haste "contradicts" with general arcane idea. I'm almost sure that if ongoing buff will not make mastery the best Blizzard will continue buffing it. The problem with assuming this is that Furty's weight is not correct for every item level. It is a general weight that people can use if they are too lazy to find their own weights, basically. At different gear levels, Vers had a higher/lower lead on Mastery, so it might be that Mastery is only better at certain gear levels. We'll see when they release the latest findings. Also note that, just because Mastery got a 20% buff, doesn't mean the weight is a simple 1.2* current weight. There are many others things to consider too. I agree that Mastery SHOULD be top by game design, but it seems they messed up. We'll see if this corrects it. Also note that, just because Mastery got a 20% buff, doesn't mean the weight is a simple 1.2* current weight. There are many others things to consider too. I tried to prove myself wrong when wrote this but I wasn't able to. It looks like all these "things to consider" are already calculated to the moment when we have been taken the final stat weights (for a certain gear and rotation, ofc). This particular buff is cumulative so we probably are allowed to multiply the current value and 1.2.
youthe way mastery was a function before based on the additive nature of the stacks at the ratio you got mastery compared with vers you would never at any gear level, int level be able to make mastery the optimal stat. Looks like all of this is now void, Mastery is indeed the top stat after the buffs. Same profile now shows Mastery (when extrapolated to fit the same scale as the first sim, with intellect at 17.03) at 15.3-ish. As I said, you can't just do 1.2*stat weight. And I'm still looking for additional source of stats weights so your link will be very helpful for me.